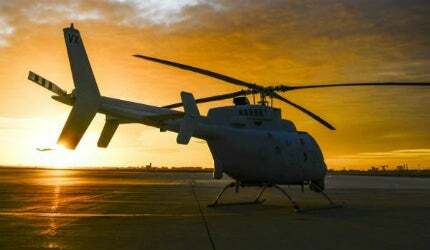 Maiden flight of the MQ-8C Fire Scout unmanned air system took place in October 2013. Image: courtesy of Northrop Grumman. The MQ-8C Fire Scout supports both land- and sea-based military operations. Image: courtesy of Northrop Grumman. MQ-8C performed its first sea-based flight from the USS Jason Dunham guided-missile destroyer in December 2014. Image: courtesy of Northrop Grumman. The MQ-8C Fire Scout UAS is developed by Northrop Grumman. Image: courtesy of Northrop Grumman. The MQ-8C Fire Scout has a flight endurance of up to 12 hours. Image: courtesy of Northrop Grumman. The MQ-8C Fire Scout is a next-generation, unmanned air system (UAS) designed and manufactured by Northrop Grumman to support both land and sea-based military operations. Northrop Grumman is currently under contract to build 19 MQ-8C air systems for the US Navy. The MQ-8C unmanned helicopter is designed to be deployed from ground and naval platforms to perform missions including intelligence, surveillance and reconnaissance, cargo resupply, and communications relay. It provides naval forces with extended over-the-horizon intelligence-gathering capability. It is an upgraded version of the MQ-8B Fire Scout air vehicle, with an increased flight time and extended payload capacity. It features a larger airframe, which is based on a modified Bell 407 light commercial helicopter. The X-47B is a strike fighter size, unmanned aircraft combat system carrier, being developed by Northrop Grumman for the US Navy. The US Navy selected Northrop Grumman as the prime contractor to develop and produce up to eight next-generation MQ-8C Fire Scout unmanned air system in April 2012. It further awarded a $71m contract to Northrop Grumman in March 2013 to build a further six MQ-8C helicopters. Northrop Grumman received a $44m contract from the US Navy to build five more MQ-8Cs in April 2014. The authority plans to procure a total of 70 MQ-8C air systems as part of a rapid development effort. The final assembly of the UAS was performed at Northrop Grumman’s Unmanned Systems Center in Moss Point, Mississippi. The first upgraded unmanned MQ-8C was delivered to the US Navy in July 2013 and its initial ground testing and engine runs were carried out in September 2013. Maiden flight of the first MQ-8C Fire Scout was conducted at Naval Base Ventura County in Point Mugu, California, in October 2013. The second MQ-8C air system was delivered in November 2013 and completed its first flight in February 2014. In May 2014, Northrop Grumman announced that the MQ-8C Fire Scout would undergo electromagnetic interference testing prior to the ship-based flights, to ensure its safe operation aboard the US Navy ships. Precision sloped landing tests of the helicopter were completed in August 2014. The first operational MQ-8C Fire Scout UAS was delivered to the US Navy in early December 2014. The unmanned helicopter completed its first sea-based series of flights from the USS Jason Dunham (DDG 109) guided-missile destroyer off the Virginia coast in December 2014. It performed 22 take-offs and precision landings on the ship during the tests. "The unmanned helicopter completed its first sea-based series of flights from the USS Jason Dunham (DDG 109) guided-missile destroyer off the Virginia coast in December 2014." The MQ-8C Fire Scout features a rugged and versatile design, which allows it to perform fully autonomous flights. It is equipped with a four-bladed main rotor and a two-bladed tail rotor. It has the ability to take-off and land on prepared or unprepared landing zones. When operating from air-capable warships, the UAS can be controlled from the ship’s ground control station. The unmanned helicopter measures 12.6m-long, 2.7m-wide and 3.3m-high, and has a rotor diameter of 10.7m. Its maximum weight is 6,000lbs, internal payload capacity is 500lb and typical payload capacity is 300lb. It can carry a maximum sling load of 2,650lb. The MQ-8C Fire Scout UAS can be integrated with a range of payloads to provide war fighters with enhanced surveillance. Its payload systems include laser range finder (LRF), communication relay, electro-optical/Infrared (EO/IR) sensor, and an automatic identification system (AIS). The EO/IR sensor generates full-motion video and offers increased situational awareness in both day and low-light conditions. The helicopter can be optionally equipped with a maritime radar and a COBRA mine detector to meet future operational needs of maritime and ground forces. "The helicopter can be optionally equipped with a maritime radar and a COBRA mine detector to meet future operational needs of maritime and ground forces." The MQ-8C UAS is powered by a Rolls-Royce M250-C47E engine rated at 522kW. The engine is equipped with a new dual-channel full-authority digital engine control (FADEC). The helicopter offers a maximum speed of 135k and a range of 1,227nm. It can operate at an altitude of 16,000ft and can endure for up to 12 hours. Northrop Grumman awarded a contract to Summit Aviation in July 2012 to build and install Faraday cages on the MQ-8C Fire Scout unmanned helicopter. The cage protects the helicopter’s critical electronic components against strong electric fields and electromagnetic waves. In August 2012, a $3.7m contract was awarded to Cubic Defense Applications for the supply of a new multi-band digital data link system, which is used for transferring imagery and video from MQ-8C to the control station. Other contractors involved in the MQ-8C Fire Scout programme are Bell Helicopter, General Electric Aviation, Sierra Nevada Corporation and Honeywell.